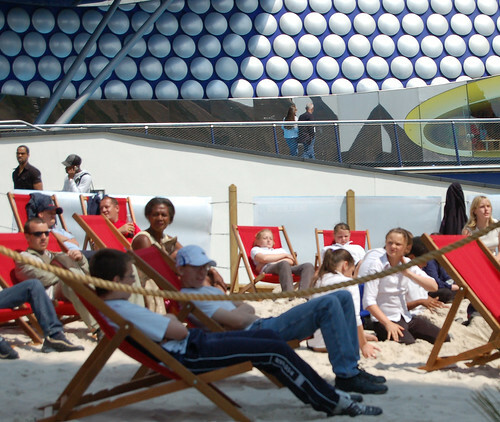 I popped down to the Bull Ring this afternoon, with my flip-flops, windbreak and swingball – we love beaches at B:iNS (see we do). Despite the palm trees wicker parasols, it’s really just a 10m square sandpit – they do have podcast tho but as you need to be a ‘browse bullring’ member I’ve not bothered. It’s not a beach without water really, and ‘wednesday afternoon for grown-ups, with music supplied by galaxy’ doesn’t thrill either. Beach two has a big telly, beach three punch and judy, beach four scantily clad volleyballers. Your glass really is half empty isn’t it! Why not celebrate the tremendous effort that has brought a superb new facility to the centre of Birmingham rather than focussing on what it doesn’t have? I went yesterday and the beach was full of school kids, some of whom had never been to a beach before, having an absolute wail of a time. So get off your high horse and don’t visit the beach again – leave it for those who appreciate and enjoy it. lighten up, my tongue is firmly in my cheek as ever. What i mean is, it’s fun, it looks lovely – have a look at the pics if you want. But despite all the hype and arguing, a man-made beach is just a sandpit – the other three will be too. I’ve actually never seen the point of beaches anyway, sand being just dirt that is (usually!) closer to the sea than some other dirt. I agree, yes fundamentally it’s just a pit of sand, but it’s a pretty nice looking pit of sand and it makes people happy. I saw two separate school trips there yesterday and the kids loved it. Some of the children said they’d never been on holiday, so if they can come to the middle of Brum and enjoy making some sandcastles for a few hours, surely it’s a good thing? Personally, if the Bullring want to spend a load of money to make my lunchtimes more pleasant, I’m happy to let them do so. You could have sat there anyway. Nothing disappoints as much as hype. I’m not sad, I’m quite chripy, you seem to be a bit riled tho’. You’re perfectly well aware that by making a public statement you assented to the “I am obliged to like absolutely everything” contract. The key to good satire is subtlety. I can’t believe the reaction to such a light hearted article. My friends and I, all born and bred Brummies. Quite regularly riducule the “beach”. I mean, it is ridiculous, isn’t it. For me it’s the real life equivalent of the scene in The Holy Grail with the peasants playing in the mud. And no, I’m not a snob, I was brought up on the Hawkesley Council Estate. But if I ever caught my parents catching some rays on a deck chair in an oversized sandpit, I would disown them. Then again, I did hear rumours of another such scheme being planned for a beach beneath Spaghetti Junction. Come on Brummies, we can do better than this.